2015 is going to be a big year for many people. You may be getting married, having a baby, buying a house or following a dream. 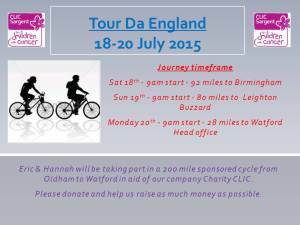 For Eric Fulham and Hannah Dawson 2015 is the year they embark on a 200 mile bike ride to raise important funds for the charity CLIC Sargent.